The United States Olympic Training Center is rated by TripAdvisor as the 9th top activity to do in Colorado Springs. The newly renovated 8 million dollar Visitor Center hosts nearly 140,000 visitors each year. The USOC chose Colorado for the training center to give their athletes an edge by training at higher altitude. The training center was originally slated to be built near the Keystone ski resort. However, thanks to the clever negotiations of prominent business owner Thayer Tutt, the training center was diverted to Colorado Springs and sets on what was once ENT Air Force Base. The campus features gorgeous walkways lined with 205 different flags from the countries that compete in the olympics. The dormitories house 557 coaches and athletes from all over the world. The athletes enjoy gourmet meals at a dining facility that has been recognized for commitment to excellence by the American Culinary Federation. The training facilities include: state of the art shooting range, V-shaped bottom olympic swimming pool designed to minimize wake interference, gymnasium, brand new state of the art weight training facility, and cycling velodrome just down the street. 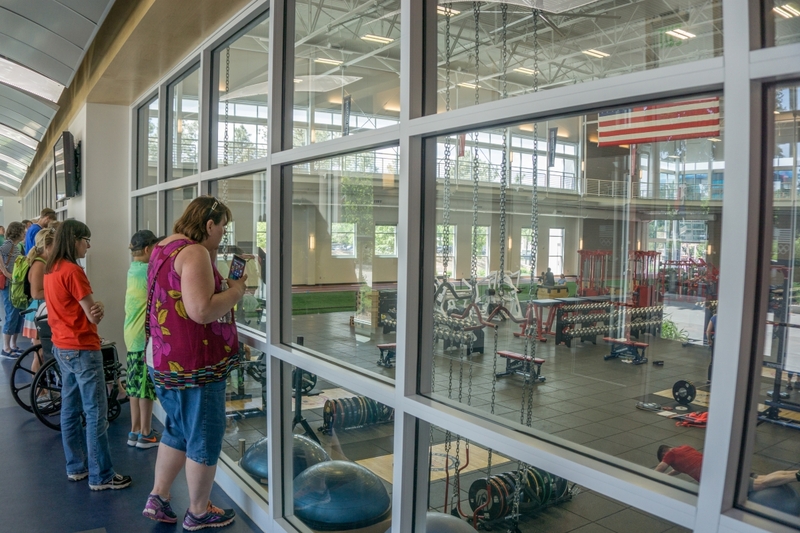 In touring the training center, you get to see athletes pouring their heart and soul into their training regimen. This allows you to catch a glimpse of what it takes to compete with the best athletes in the world. From its gorgeously decorated walkways to its million dollar training facilities, touring the U.S. Olympic Training Center is a fascinating peek into the world of top level athletics. This entry was posted in Attractions, Blog, Community and tagged colorado springs, Olymipic Training Center, Tourist Attractions. Bookmark the permalink.